The bitter November wind thrust its cold breath towards me, breaching my layers of clothing. Dry flakes drifted down from an overcast sky coating the stone steps with a thin layer of snow. I stood on the ground and gazed up at sharp peaks that looked as if they could pierce the cloud cover. A steep grade of granite steps twisted up the mountainside; history loomed before me with hundreds of stories concealed in the stone walls. I strutted around on the frozen ground, testing the elasticity of my knees, determined to make it to the first plateau. I started my ascent at the first set of stairs, keeping a steady pace, clinging to the railing that jutted out from the low stone wall. I stopped occasionally, checking for any pain or twinges in my body. I took a break halfway up the first set of stairs; through the lens of my camera I watched teenage girls giggling as they took pictures of each other; I saw families, some with young kids, bumbling their way up the mountain; I watched couples embrace beside the chain of heart-shaped locks that stretched up the side of the wall, a symbol of ever-lasting love; I captured pictures of the maroon rutted crags that rose and fell on either side of the stone barrier. At the first viewpoint, I turned and looked down to where I started; I was surprised by how high I climbed. A wave of vertigo overwhelmed me and I swayed for a moment; I plunked down on the steps, allowing myself to get used to the elevation. Roads twisted like snakes in the deep valley; the traffic that clogged the highway was almost unnoticeable. Eventually, the dizzy spell passed, and as I continued upward, I noticed the winter chill had been replaced by the heat of my blood churning through my veins. The wind whipped the loose strands of my hair as I approached the top – Mother Nature’s blustery warning that she possessed the strength to push me over the side, sending me tumbling to the earth below. I clambered skyward, avoiding the snapping cameras of the tourists, up to a towering structure topped with a boat-shaped roof that waited at the peak of our hill. 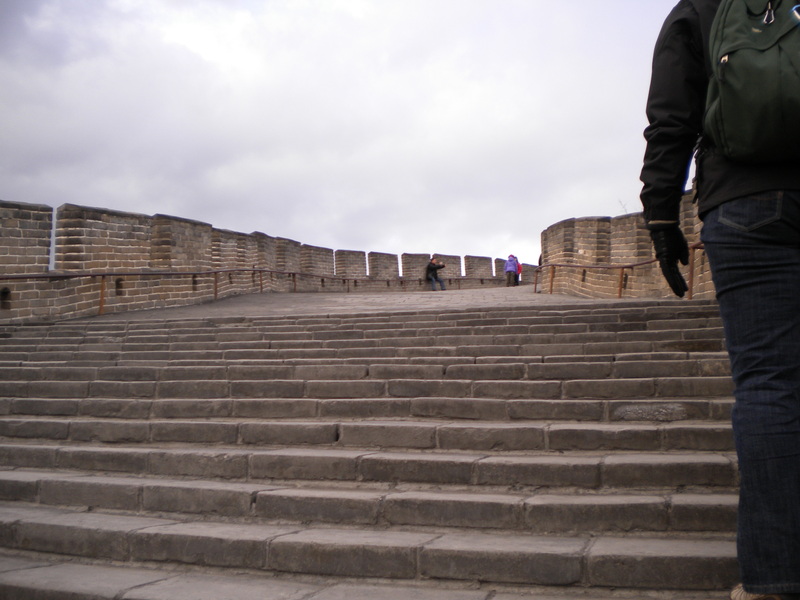 A surge of energy flowed through my body – this was, by far, the largest set of stairs I had overcome since the arrival of the old lady. I looked out over the valley – the mountains stretched for miles in both directions. I pranced along the wall, admiring the labour of such a tremendous task. I ran my hands over the rough sparkling stone, elated that I pushed the old lady aside long enough to achieve this goal. My triumph was short-lived – climbing up was one thing, going down was a different story. I clung to the metal railing, trying to keep the weight off my knees. My legs trembled when I stopped to rest, threatening to collapse beneath me – I had visions of tumbling down the steps, knocking people over like dominoes. I grabbed the railing and concentrated on each step, pushing through the pain and arriving at the base. I took one last look at the mountain before boarding the bus – I had left the old lady behind and taken on the Great Wall of China. What an accomplishment! Inspiring to hear about the Great Wall and you. How awesome that you got to see and experience this. It must have been overwhelming to be surrounded by all that fascinating history. I can relate to the stairs. Climbing up is one thing. Going down is quite another.